The Schaeffer-Minty case is a significant and pivitol opportunity to challenge long standing- deeply defended O.P.P. practices of lawyer note vetting and the retaining of the same O.P.P.A lawyer for both subject and witness officers implicated in a Special Investigations Unit investigation. The O.P.P. deeply defends these practices which grievously obstruct the ability of the S.I.U. to explore whether an officer is criminally responsible when their actions have resulted in the severe harm or death of someone. These practices provide police with impunity from the laws that govern the rest of us and leave families and communites to struggle with the violent deaths of their loved ones while police killers walk free- protected by the blue shield and an unjust legal system. The outcome of this court case will affect the future of every police officer and every citizen across Ontario and indeed will shape the parameters of justice and civil liberties in these strange days to come. The Coalition Justice for Levi is overjoyed to announce that we won a clear decision in our favor from the Supreme Court of Canada. Police officers who kill members of the public may not have their police notes vetted before submitting them to the civilian oversight body which investigates when police kill. There can be no justice for the dead… but it is our belief, as of today’s historic ruling, that those families whose loved ones are killed by police in the future will receive accurate, accountable information from police about what occurred when their loved one died and can trust that an investigation by the civilian oversight body into their loved one’s death is legitimate. An earlier ruling stemming from this case has also legally assured that police can no longer ascribe the very same police association lawyer to all police officers, subject and witness, involved in a civilian oversight investigation. We celebrate this victory against a rising tide of police impunity in Canada, but recognize that even the results of this incredible case are only one part in the work that must be done. We still have a very broken system: an Ombudsman who says police systemically refuse to cooperate with the S.I.U…. an civilian oversight body still primarily staffed by once police officers- and an Ministry of the Attorney General that refuses to uphold legislation and in fact has helped to specifically obstruct the efforts of the civilian oversight body. We still have a society blinded by its distinctly pro-police bias. We still have police killing mentally ill people because de-escalation is thought of as a special tactic to pull out and is not the primary modus operendi of police officers as they come into contact with people in distress. We still have a reality where certain people- people of colour, indigenous folk, queers, the poor, people with disabilities, vulnerable women- are disproportionately targeted, intimidated and violated by police in our communities. The work of creating a just world continues… forever until it is truly reality. We may have curbed the rise of police impunity- but we are far from living a reality of true justice for out communities. But resistance is fertile. And people are powerful. And victories do happen. The combination of state accountability focused lawyers (Julian Falconer, Sunil S. Mathai and associates), public officials willing to take tremendous risk and speak out (former S.I.U. director Ian Scott), a widespread grassroots mobilization (you and you and amazing, solid you) and the unbelievable efforts, steadfastness and self- sacrifice of two Ontario families (the Schaeffers and the Mintys) made this happen. And there is promise in every breath and every effort that more victories are to come if we commit to dedicated work, courage and an endless passion for true justice. It is now time for the Schaeffer and Minty families to rest. The work of the Coalition Justice for Levi continues as we must now fundraise in order to finish paying the legal bills so that this long hard journey for the families can be finished for good. (YES- WE WANT AND NEED YOUR HELP!) As we continue with these efforts- we shall continue to organize and mobilize around issues of police accountability and supporting affected families and communities as they experience the horror of loosing a loved one at the hand of police. And we shall continue to fight with love in our hearts for a world that refuses state violence, embraces community and takes care. And finally, to all those who have continued to support and take action in solidarity with the Coalition Justice For Levi over these last four and a half years- THANK YOU. You are all really, really shiny superstars. Will we have some justice for communities or a state of court declared police impunity? In just a few days, the Supreme Court of Canada will release a decision which will determine whether Canada's highest court will or will not permit police officers to engage in lawyer note vetting as a practice when involved in investigations by Ontario's Special Investigations Unit- the civilian oversight body mandated through the Police Services Act to investigate matters where police officers are involved in the severe injury, sexual assault or death of a member of the public. On Thursday, December 19th, 2013, the Supreme Court of Canada will release a decision which will be the final word in a legal battle that began for two Ontario families in September 2009- just months after each of their loved ones had been killed by police. In each of these cases, all officers in any way involved in the incidents had their duty notes vetted by Ontario Provincial Police Association lawyers prior to submitting them to the S.I.U. The families asked the courts to interpret the law and decide whether this highly defended police practice of lawyer note vetting- was, or was not permitted by law. In mid November, 2011, the Schaeffer and Minty families received a unanimous decision in their favor from Ontario's highest court. Unsatisfied with this court's decision- police brought the matter and these families before the Supreme Court of Canada on April 19th, 2013. We are hoping to celebrate and hope that you will consider organizing gatherings, actions and reactions in your communities across Ontario and Canada in the days after the decision is release in order to mark and help bring widespread awareness to the decision given by the Supreme Court. Whether in celebration or repudiation of the decision- the Coalition Justice for Levi would like to invite communities and allies to organize in solidarity and help make sure that these two Ontario families who have battled so long and hard to help create a state of greater justice for us all feel supported and recognized in their fight against systemic police impunity in Canada. Help us get word out to the media, below here is a link to a media advisory for you to share. JUDGEMENT DAY: Will we have some justice for communities or a state of court declared police impunity? The Schaeffer and Minty families will meet with their lawyer, Julian Falconer, on Thursday afternoon to read, review and digest the decision- as well as to prepare to give widespread media comment with their lawyers early Friday. What happens next is up to you. CALL FOR ACTION:We are hoping to celebrate and hope that you will consider organizing gatherings, actions and reactions in your communities across Ontario and Canada in the days after the decision is release in order to mark and help bring widespread awareness to the decision given by the Supreme Court. Whether in celebration or repudiation of the decision- the Coalition Justice for Levi would like to invite communities and allies to organize in solidarity and help make sure that these two Ontario families who have battled so long and hard to help create a state of greater justice for us all feel supported and recognized in their fight against systemic police impunity in Canada. Help us get word out to the media, click here for a link to a media advisory for you to share. Watch the proceedings from our April 19th, 2013 Supreme Court date. Justice for Sammy. Justice for Levi. Justice for us all. It is with the deepest respect that the Coalition Justice For Levi sends love, strength, understanding and heartfelt wishes for healing to the Yatims and to Sammy’s friends and community. The recent police killing of 18 year old Sammy Yatim has reopened deep wounds for all families who have had a child taken through police force. This tragedy has also sparked the opportunity for many families with many voices to speak together to put forward the unified message that the ‘accountability’ measures in place aren’t working, that recommendations from coroner’s inquests aren’t being implemented, that the Attorney General’s office has been either negligent or obstructive and that at all levels, government needs to wake up and make holding police to account a lived experience and no longer a longed for ideal. Thanks to the Ontario Federation of Labour and the Urban Alliance on Race Relations for hosting August 13th's important news conference to create a chance for multiple families of those who have lost loved ones to police action to speak, united with incredible, dedicated community organizations. 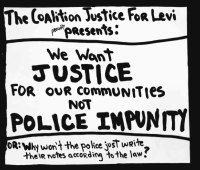 It is the hope and work of the Coalition Justice for Levi to continue to support a growing communication and collaboration between families and communities affected by police killings. We want to outreach to other directly affected families and communities and grassroots bodies who want to work politically and legally to fight police abuses and to create a state of accountability. We wholeheartedly support the work of Ontario’s Ombudsman office and ask our supporters to support this work. We also ask supporters to write to their M.P.P.s and to the Office of the Attorney General of Ontario to insist that the recommendations from Ombudman reports be implemented immediately. Justice for Levi - Justice for Us All! Donate to help raise the funds for the Schaeffer family to pursue its application to the courts questioning the process of investigation into the police shooting of their belovedLevi. For the last decade of his life, Levi, like many psychiatric survivors, experienced endless injustice as he was socially and economically oppressed, disregarded, denigrated, institutionalized, and criminalized. Help to empower a chance for some justice for Leviand his bereaved in the tragic circumstances of his death. Give a cash donation towards the ever rising legal costs. Donate an item or original art piece to auction, or lend your support in else wise kind to this fundraising campaign for Justice For Levi. Or by using the Paypal donate button on this site. For More information Click on "the story" link located at the top of the page. Watch the video:"We want justice for our communities not police impunity!" We have a new popular education tool! A video we made in the last week or so after hearing the news that the case is probably going to supreme court. It's 15 min long and attempts to make as clear as possible the story of the Schaeffer/ Minty case. Please note that the supreme court date mentioned in this video has changed.